In training camp, when a wide receiver catches the football across the middle, the players in the secondary don't even wrap them up. Instead, they do a "break down" stance in front of the ball carrier, assuming the tackle would have been made. 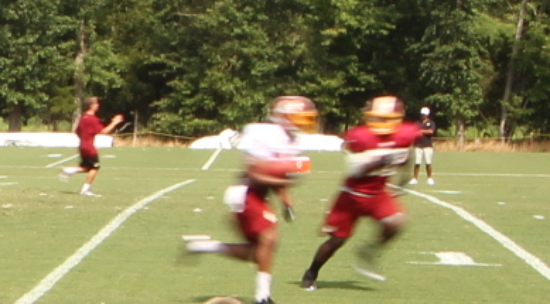 Over the course of Redskins training camp, Reed Doughty in particular made a lot of big hits and tackles, without actually touching the opposing player. Fake football pro-bowler! Is the result of this play a touchdown or did the corner make the game saving tackle? We'll never know. The lack of tackling in camp makes it hard to get a good feeling about how the offense or defense is working. Who knows what would have happened with certain plays. Full contact could have told the story of a 2 yard run or a breakaway touchdown, but with no hitting the same play could be interpreted as both depending on who you ask. "He would have made the tackle" is what the defense will tell you. "He would have broke the tackle" is what the offense will tell you. That kind of play is found throughout training camp and is encouraged in order to help avoid injury, especially in practices where players are not even wearing half of their pads. It is also mandated by a set of NFL contact rules that now only allow teams to have full contact practices once a week during the season. That type of practice leads to the kind of play that was exhibited at Sunday night's NFL Hall of Fame game between the New Orleans Saints and Arizona Cardinals. The type of play that included a pathetic display of one of the most basic parts of the game; tackling. The running backs on both teams were bouncing off defensive lineman and then running through the flailed gator arms of the secondary. Each defense putting on a poor display of tackling fundamentals. As the weeks of the preseason roll on, tackling will improve, but no thanks to non-contact practices. It will be because of the few precious plays in full speed games that defensive players will get during these exhibitions. So onn Thursday night when the Redskins take the field against the Buffalo Bills for their first day of game-speed hitting, fans should expect to see some missed tackles. But now, the players can't just claim "he was down" they have to prove it.